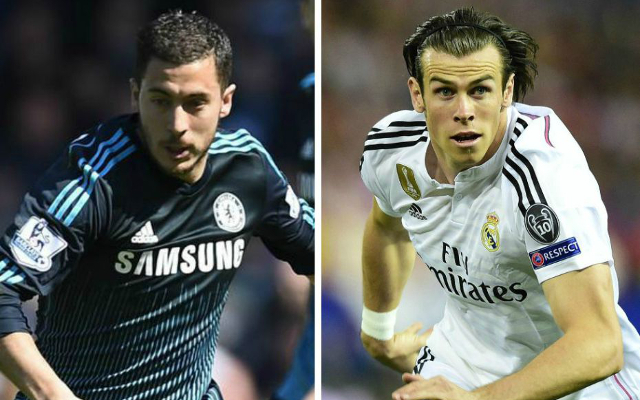 Manchester United’s pursuit of Gareth Bale may yet be given the green light if Real Madrid can land Chelsea star Eden Hazard as a replacement, according to reports in The Express. The reports suggests that Madrid are warming to the idea of selling the Welsh winger for a huge sum and are set to target the Blues brilliant Belgian to fill the void at the Bernabeu. Prizing the player away from Stamford Bridge could prove to be a difficult obstacle for the La Liga giants to overcome as he only signed a new deal with the West London outfit at the start of the year. But as seen with many transfers involving Los Blancos in the past, when they come calling they usually get their man and should they sign the winger it would be a big blow for the Premier League altogether. Hazard is regarded as the hot favourite to land the PFA Player of the Year award after playing a crucial part for Jose Mourinho’s side as they close in on a first league title since 2010 and he scored the winner against Manchester United last Saturday to move the leaders 10 points clear at the top of the table. It is difficult to imagine Mourinho selling the club’s best player in order to strengthen an United side that is very likely to be challenging for the title next season.